She is too cute to be up to something! LOL! Goodness look at that face and those eyes! You are in trouble as she gets older, you will never be able to say no! She is so cute! They grow so fast. She's saying, "Where's the food? Put away the camera or I'm going to stop smiling!" 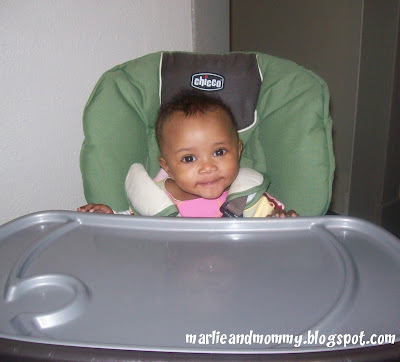 she looks like such a big girl in her high chair!